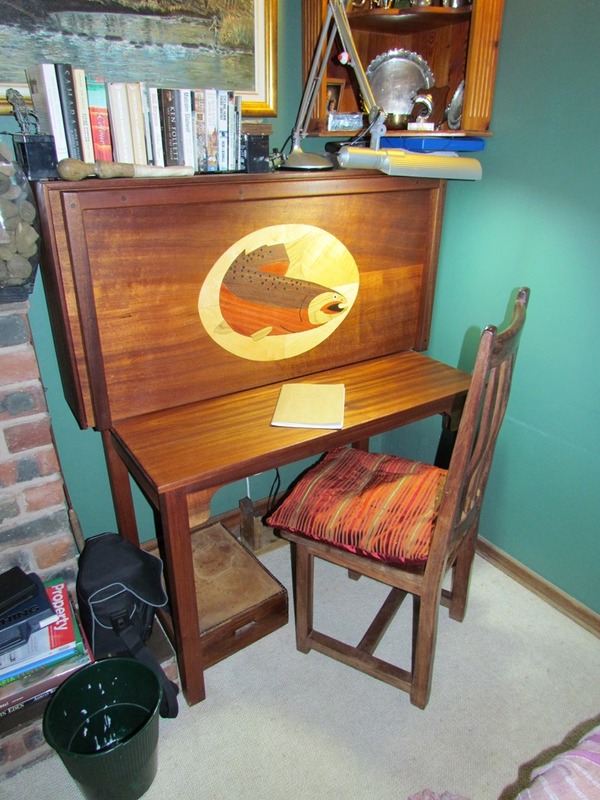 I tidied my tying desk this evening, as I do once in a while. The maid normally remarks favourably when I do this, since she is not allowed to touch. I think the abandon with which I toss around dead birds and animals gets to her. Thing is, when the desk is tidy, I can actually lock the thing, as my brother intended when he made it for me. I have to say though, that I was a little worried. I was worried that it would not close. This anxiety stemmed from the fact that I have been on a long steady acquisition phase. I hadn’t realised it, but I have been collecting again (did I ever stop? ), and the drawers are starting to overflow and jam with packets of goodies. I am happy to report that I was successful. I will not be needing another chest of drawers, and so will not be jeapardising my spot in the corner of the lounge. Which brings me to my point. 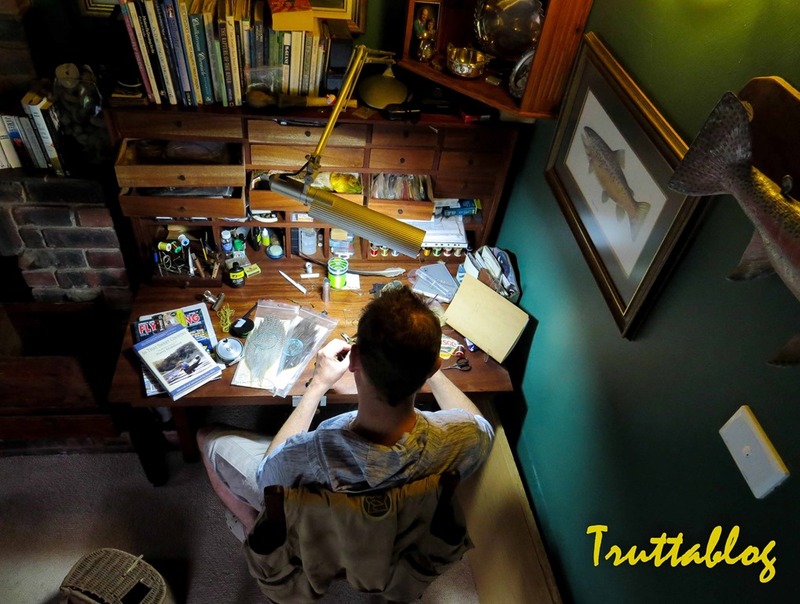 You MUST have a room, or better still a corner of a family room or lounge, where you can leave your fly tying kit out. Trust me on this one. Until you do that, your tying will be frustrating, infrequent, and uninspiring. You cannot be hocked by having to clear away for dinner or guests. This will cramp your creative style in ways that you will only come to appreciate when you do get it right and have a good setup. When you do get set up, a peaceful fulfillment will descend upon you, and you will become a much better husband and father. For me it has worked to have this space in a corner where I am not locked away from the family. I have a corner of a room in which the family can sit around while I tie, and it is a magic recipe for family harmony. Now print this piece, and go and show it to your wife. This entry was posted on December 11, 2014 by trutta. 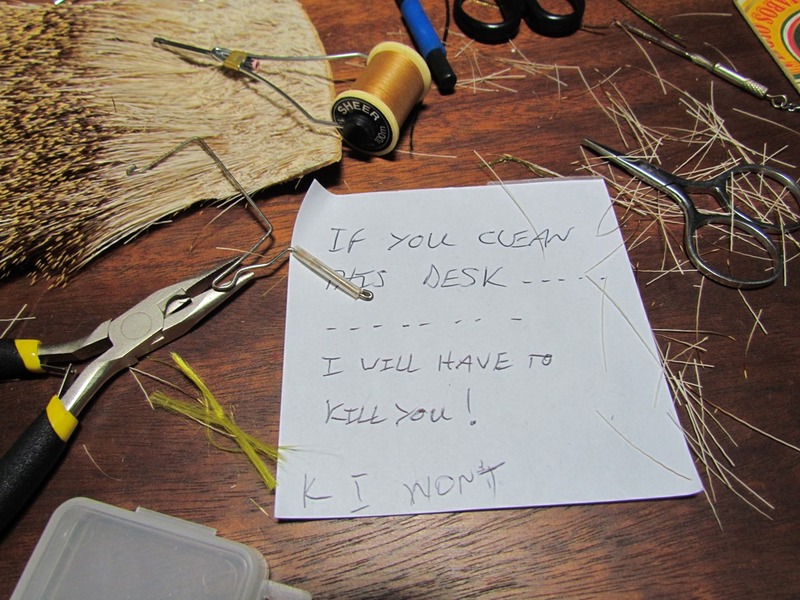 It was filed under Fly Tying and was tagged with Fly Tying, fly tying desk, workstation. This is the best fly tying nook around. Hope I don’t become unpopular but it looked better last time I called round. Don’t worry Roy. It never stays tidy for long! We have company coming this week so the wife asked that I clean out my cave including my tying corner. I don’t understand why, no one else is allowed in!